Harry Potter And The Half-Blood Prince, the sixth film adaptation of JK Rowling's best-selling books, will premiere in London on November 17th 2008. Fans will have to be content until then with the official trailer, which leaves audiences fearing for the life of Harry's best friend Ron Weasley. Harry Potter And The Half-Blood Prince, the penultimate Potter book, is one of the darkest movies yet in the series, and the dark theme of the trailer below promises to be the scariest film yet from the Harry Potter series. Harry Potter And The Half-Blood Prince brings back previous big stars of the Potter film to the big screen, including Dame Maggie Smith as Professor McGonagall, Helena Bonham Carter as Bellatrix L'Estrange, Robbie Coltrane as Rubeus Hagrid and Alan Rickman as Severus Snape. 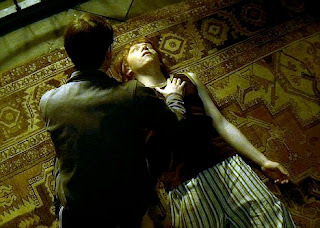 Ron Weasley poisoned - Will he survive? Big Brother got tough with housemates in the BB9 house for taking about nominations. While Dale and Luke were nominated by the housemates, Big Brother surprised the twelve remaining housemates by announcing that another seven would be facing eviction by the public vote this week. BB9: POLL - Which Housemate Do You Want Evicted? BB9: Day 55 - Stuart "I Wanna Go Home"
Amy Winehouse has been rushed to hospital once again, a spokesman for the 24-year-old confirmed she had been taken to University College Hospital but did not say why she had been admitted. Earlier in June she was admitted to hospital after collapsing at home. It was later discovered Amy Winehouse had traces of the lung disease emphysema. The ambulance was called to her house in Camden, north London. A London Ambulance Service spokeswoman said: "We were called at approximately 8.40pm to an address in NW1 to reports of an adult female taken unwell. "We sent an ambulance and a fast response car and the patient has been taken to hospital." According to the BBC website. 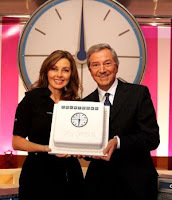 More details about Carol Vorderman's surprise departure from Channel 4's 'Countdown' have been revealed in the media . Claims that Carol was 'forced out' by bosses have been printed in the News of the World. "The show survived easily without Richard Whiteley and it will survive easily without you." Carol was told as she was given just 48 hours to take a 90% pay cut as programme makers faced cuts in their budget. "To be honest, I loved Countdown so much I was thinking of taking the cut. In fact, in the right circumstances I'd have done it for FREE—but it was obvious they wanted me out." 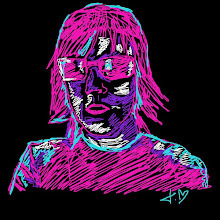 Carol told the News of the World. Her agent rang her while she was in the dressing room on Wednesday telling her, "I don't know how to tell you this, but I've just had a letter asking you to take a 90 per cent pay cut." Carol told us: "It was non-negotiable, take it or leave it. I was shocked." Carol had spoken out following rumours claiming she had greedily demanded a HALF A MILLION POUND pay rise and the main presenters job. Rebecca Shiner became the sixth housemate evicted from the Big Brother 9 house, with 65.4% of the vote. Sent back to Coventry with an emotional farewell but in true Bex style, it was a noisy departure. It has been an eventful 51 days for Rebecca in the BB9 house from the ChipGate shocker with Alexandra to the MoSnog kiss on Day 50. Luke won't we the only person to miss Rebecca, Coventry will miss her in the house. For all the pictures, videos and news on Rebecca and Big Brother check out Big Brother Blog Squad. Carol Vorderman has sensationally announced that she is to quit Countdown after 26 years on the Channel 4 show. The longest running Channel 4 programme is now in turmoil after Carol Vorderman told bosses she planned to leave after failing to agree a new contract. Rumours say Countdown producers wanted to cut costs and Carol could not agree a new contract. Just days earlier Des O'Connor quit the show, which was first broadcast on the network on Tuesday 2nd November 1982. Carol Vorderman's manager said she was "extremely sad" to be leaving Countdown. Scouting For Girls will be performing at Coventry's Ricoh Arena Jaguar Exhibition Hall on Sunday 30th November at 7pm, as part of their nationwide tour. Tickets went on sale today and are expected to sell out quickly, just like their other UK shows in Plymouth, Brighton, Southend, Wolverhampton, Swindon, Cardiff, Portsmouth, Liverpool, Leeds and Brixton London. The band performed in front of thousands at this years Glastonbury and have enjoyed chart success during the past year with She's So Lovely (#7),Elvis Ain't Dead (#8) and Heartbeat (#10). The Enemy performed at Coventry's Jaguar Exhibition Hall in April with all 8,000 tickets selling both nights and Scouting For Girls look set to match that figure for the venue. Their debut album shot to the top of the charts in January, already selling over half a million copies. Tickets are on sale now priced £17.50 from Ricoh Arena’s website www.ricoharena.com or by telephoning 08444 121 747. Special guests will be announced soon. 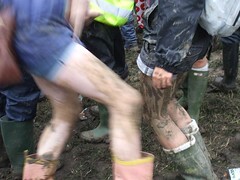 Tickets for Glastonbury 2009 will go on sale early, with 100,000 festival-goers being able to purchase tickets in October 2008. Instead of paying the £170+ expected price, a £50 deposit will be accepted with the remainder being paid April 2009. If fans change their mind during that time, they will only have to pay a £10 charge. Demand is expected to be high following this years Glastonbury success and the promise of more traditional headliners instead of a controversial headline act like Jay-Z. 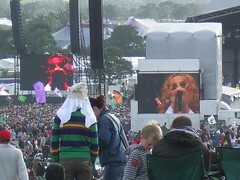 Michael Eavis revealed that some bands are already on board for Glastonbury 2009 with three or four headliners in mind. It cost about £22m to stage Glastonbury and competition is tougher than ever as festivals run right across the UK during the summer, yet almost £2m will be donated to charity. Instead of paying headline acts more than £200,000, Eavis told the BBC that performing at Glastonbury is good for the artist, record sales and record companies. 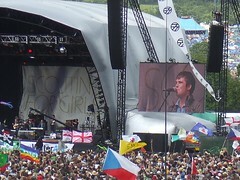 He was also pleased a younger crowd had returned to Glastonbury. Emma Bunton will be co-hosting 'Richard and Judy' with Richard Madeley while his wife Judy Finnegan recovers from knee surgery this week. The series will be their final one with Channel 4 before moving networks. Also news that Des O'Conner will quit Countdown was also announced today meanwhile Emma Bunton will present the teatime programme until next Tuesday saying, "As a fan of the show, it was an honour to be asked to step into Judy's shoes for a few days, co-present the show and keep Richard in line!" The official Channel 4 website for 'Richard and Judy' has daily updates. ITV's Emmerdale has won the head to head soap battle against the BBC's Eastenders. Last night the popular soaps were shown at the same time as Emmerdale aired an hour long episode between 7 and 8pm, featuring Katie going into labour. It was watched by 5.8m (33% audience share), beating Eastenders by almost a million. Eastenders storyline of Tanya calling a peace meeting with her estranged husband Max failed to ignite viewers, just 4.9m tuned in, giving Eastenders it's fourth worse viewing figure of the past five years. Often when the two soaps go head to head, it is the BBC who emerge victorious - but this week it will be ITV who can claim the soap battle victory. Amy Winehouse was not in court today as the judge told her husband Blake Fielder-Civil, that he was to be sentenced to 27 months in jail for for attacking a pub landlord and perverting the course of justice. Blake also admitted at Snaresbrook Crown Court, London trying to make Mr King withdraw his complaint using a £200,000 bribe. Fielder-Civil has already spent nine months in jail on remand. In his defence, the court heard how Blake was determined to rebuild his life with his wife after a history of self-harm and suicide attempts. Amy Winehouse has vowed to stand by her man and wait for him while he serves his remaining time. 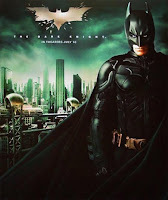 The new Batman movie The Dark Knight, has broken box office records in America on the first day of release. It took $66.4m (£33.2m) on it's opening night, breaking the previous record held by another comic book hero, Spiderman ($59.8m / £29.9m) last year. The UK premier of Batman: The Dark Knight will be shown in London tomorrow (July 21st). 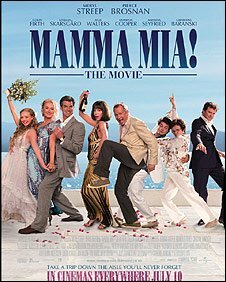 ABBA continue to live on with the latest movie 'Mamma Mia! - The Movie' topping the UK charts this week, easily forcing Will Smith into #2 with 'Hancock'. The musical was the clear winner, bringing in over £5m at the box office this week alone. The UK's most played records over the last five years have been released by the Performing Rights Society. The chart included plays on TV, radio, websites and in venues and revealed a mix of British and non-British songs making the Top 10. 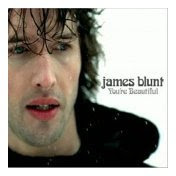 Highest British entry was 'You're Beautiful' by James Blunt. Snow Patrol, Take That, Corinne Bailey Rae and Will Young made up the other Top 10 British entries. Dizzee Rascal/Calvin Harris (Dance Wiv Me) and The Last Shadow Puppets (Standing Next To Me). Pint Shot Riot are a well known local band who have been juggling music and work for several years, recently supporting We Are Scientists as well as appearing at the Godiva Festival. Rocket, Baby Dave, Mini Rocket and Rob will be supporting The Twang in London on July 25th, the single 'Start Digging' is available from all good record shops now (or click the picture and order from the HMV website). 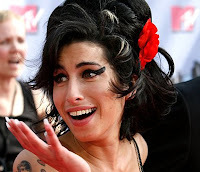 Amy Winehouse has the Best Selling Album in the world, so far this year. 'Back To Black' has sold 3.67m copies during the first six months of 2008. Total sales of the album has now reached almost 10m (9.78m) as Amy continues to dominate the tabloid newspapers with her private life. Coldplay look set to steal her crown by the end of the year with 'Viva La Viva', the album went to #1 in the UK and US, selling 2.6m copies in just a few weeks. Brits are dominating the world music scene this year and X Factor winner Leona Lewis has proved we can make it in America. Her debut album 'Spirit' has sold a staggering 2.4m copies and is currently enjoying chart success in America. The only American in the Top 5 is Jack Johnson in fourth with Welsh sensation Duffy beating Madonna at 5th place with her debut album 'Rockferry'. Headlining the Godiva Festival in Coventry was the natural choice for The Enemy, having achieved so much during the past year. While Tom Clarke, Andy Hopkins and Liam Watts have enjoyed a number one album and awards, they have always remained firmly down to earth and loyal to Coventry. Tonight was the night The Enemy returned home to Coventry and put on a free performance in front of thousands. This year there was no tent to restrict the numbers and no matter how much it rained it didn't stop the masses from standing firm in their support of the lads who have done so much for this city. Slowly the umbrella's came down and the hands went up in unison as the whole of Godiva sang "We'll Live And Die In These Towns" and "You're Not Alone" - being reminded by Tom Clarke that the song was dedicated to the ex-workers from Peugeot. Andy Hopkins and Liam Watts proved as energetic as ever through out the show, with Andy darting from side to side on stage - wisely avoiding crowd surfing and thus keeping his clothing during the duration of the set. As well as playing hits from the debut album, the Coventry crowds were treated to a new tune as a taster for things to come. The debut album went to number one exactly a year ago and has remained in the UK album chart virtually the whole year, sitting at #85 this week. The Enemy performed at Coventry's Godiva Festival and here are a selection of videos from the headline act. Thousands braced the rain and cold winds and stayed at the free festival in support of The Enemy, who have done so much for Coventry. The Kombat Breakers performed at Coventry's Godiva Festival as they plan to release their first single following their success on Britain's Got Talent last year. The break dancers gave the festival crowd something different on the Main Stage as they jumped, danced and slam dunked around the stage to their track "Caramel". Millions saw these Coventry lads on ITV and now they continue to inspire not only the young people of Coventry but also teenagers around the nation in a positive way. Pint Shot Riot believe Coventry has an opportunity to be firmly established on the musical map and then put on a stunner of a show at the Godiva Festival to prove it is true. The band stand at the edge of something big as their single "Start Digging" is released on Monday 7th July. They are another proud band that big up Coventry and told the crowds they are the one's that make a difference. As fans danced, moshed and sang along, Pint Shot Riot gave the happy crowds something to remember from the Godiva Festival. I heard people saying the band were better live than on their MySpace page and reactions from the crowds were clear to see - Coventry loves Pint Shot Riot. As well as playing their familiar tunes, the lads also played a new track, which was an instant hit with the masses - watch the video below and judge for yourself. Hopefully many of those in attendance will now do their bit in helping local music and support Pint Shot Riot in their bid to make it big by purchasing the single on Monday. The Ripps were on the Main Stage again this weekend at Coventry's Godiva Festival and played a combination of new and old songs that injected enthusiasm into the crowds that had gathered in anticipation. No-one was left disappointed because Patch, Raul and Rachel gave another fantastic performance. Even when the rains came down, it didn't dampen the young people that were jumping around to the sound of SKA with The Ripps. 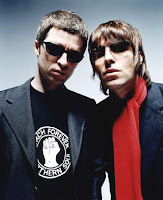 Oasis have seen their sales rise this week thanks to Jay-Z and that controversial Glastonbury performance. The US rap star used Oasis 'Wonderwall' as his opening song and now the former hit looks set to re-enter the UK charts on Sunday. 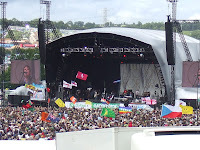 Other artists such as Kings of Leon have seen two of their albums storm up the charts in the mid weeks, while Jay-Z has failed to benefit from the much talked about Glastonbury headliner. His current album 'The Black Album' is only number 80, selling just over 700 copies this week. A lazy start to the day with a walk to the Jazz World stage for even more rest before trying to watch Newton Faulkner at the crowded Other Stage. His simple guitar playing and humble attitude was a pleasure to watch, even if I couldn't hear him very well because I was so far away. eventually I left the crowds and grabbed a view from the road behind and stayed there for Jack Penate and Scouting For Girls. It was a view from the bushes but it was crowd free and I liked that. Jack Penate was another down to earth musician that was lapping up the privilege of performing in front of thousands at Glastonbury. Crowds had shown up in their thousands once again as the sun shone through broken clouds from time to time. Scouting For Girls livened up the Glastonbury faithful with a string of hits and got everyone joining in their especially written Glastonbury song 'See You Next Year At Glastonbury'. Perfect timing to go and join my friends as we packed up our tent and headed one last time to the Pyramid Stage. Neil Diamond was belting out the tunes and it looked like capacity crowds were watching as well as singing along to his classic tunes. I was even joining in during 'Forever in Blue Jeans' as I marvelled at the sight before me. The final act we saw at Glastonbury was Goldfrapp, who seemed a strange choice for the main stage but proved their worth as they captivated us in time with their hits. Time to head home and reality, but it was a funny end as I got home at 02:15am to find myself locked out, having to get my sleeping bag out and spend the rest of the night on my doorstep. Now I've got the Glastonbury bug and can't wait for Glastonbury 2008 - no matter who headlines, the festival is more than any one artist. Today the sun was out and spirits were high for the second day at Glastonbury, the mud was drying but the hangover was kicking in as the tent warmed up to the morning sun. What better wake up call can you have than the classic Shakin' Stevens? I couldn't resist going to have a gander and watch him perform 'Green Door' and 'Marie' - Not bad for the first performer of the day. 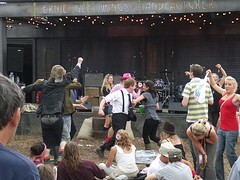 I went to explore the Glastonbury site a bit more (apparently it's the size of Bath) and ended up in the Dance Village watching a band called A Human, who put on the best performance I was to see this year at Glastonbury. Each of the six band members put on a performance to be proud of, the lead singer was so energetic throughout, at one point leaping from the stage and dancing with the crowds. Then taking his shirt off, waving it in the air while rolling on the floor outside the tent - pure genius! This was the band that made a lasting favourable impression on me and hope they do well, especially since the lead singer had just quit work to become a full time musician. The afternoon was spent relaxing on the ground at Jazz World listening to the delightful sounds of The Blessing, adding an air of spirituality. Massukos treated the crowds to the vibe of Mozambique followed by Eric Bibb and the legendary Joan Armatrading, who won over the audience like she did back in the 70's. It was nice and mellow just chilling out to the sounds from the Jazz World stage then it was time to move on and capture more music in the form of Will Young in the Avalon Tent. He proved to be a popular attraction with many more people outside trying to listen in on his gentle performance. I gave up trying to listen so we moved to Dance West for some busting moves with The Grid - not even a drug in sight as we were taken back to the early 90's "rave" tunes. 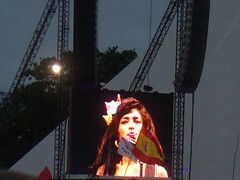 Amy Winehouse was another highlight for Glastonbury, while she may be out of it during songs, I loved her voice and her tribute to Coventry band The Specials was touching. 'A Message To You Rudy' and 'You're Wondering Now' added credibility to her much talked about appearance. The night was concluded with Massive Attack, while not my cup of tea, the stage lighting was amazing and the crowds loved the variety of tunes presented.